The Miserere in B flat minor for soloists, chorus and orchestra shows the unique position occupied by E.T.A. 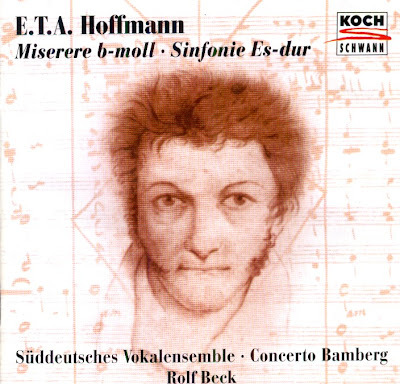 Hoffmann in musical history. Of all composers of the Romantic period it was Hoffmann who thought most deeply and wrote most perceptively about the aesthetics of his art and in particular about the true nature of church music. It is therefore no coincidence that the first of his writings to appear in print bears the title "Epistle of a Monastic City". Although the article appears to be chiefly concerned with the role of the chorus in the theatre since the time of the ancient Greeks, Hoffmann's main preoccupation is in fact the art of choral writing in the musical sense, a problem therefore whose solution is to be sought principally in church music. During the next two decades Hoffmann wrote many more essays on musical problems and works, most of them appearing in three instalments in 1814 under the title Church Music Ancient and Modern. As the date of his Miserere falls almost exactly half-way between the dates of the first essay and this comprehensive collection of writings, posterity has the comparatively rare advantage of being informed by the composer exactly what aims and ideals were influencing him at the time of composition. The lyrical and dramatic elements which are clearly an important part of Hoffmann's individuality as a composer are evident in the Miserere. Yet he carefully avoids operatic devices in his vocal writing, especially the arias. Quite outstanding thoughout the entire work is his impeccable Latin prosody, i.e. his musical diction and respect for the text, although in fact he chose not to set the whole of the psalm; some passages are omitted, as can be seen from the printed text, and this gives the work a structural balance that is almost classical. Hoffmann's Miserere is the work of a man well acquainted with tradition and confident in handling it as the fugal sections clearly show - but one who openly admitted to being a romantic innovator in the realm of large-scale church music. Being a Protestant, Hoffmann had not grown up with this tradition, unlike Haydn and Schubert. Mentally and technically he had to acquire it before he could use it as a medium for his own personal feelings. In the Miserere he finally made the style his own. This is why the Miserere can undoubtedly be ranked among the relatively few masterpieces of church music music written at the beginning of the Romantic Era. The Compact Disc was released by Koch Schwann, 1997, (DDD). Koch 3-1148-2.